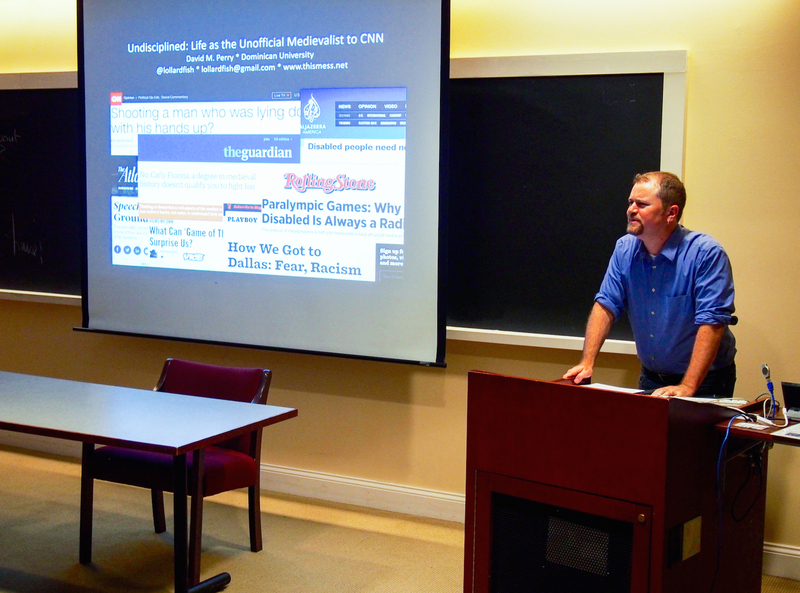 In addition to his current roles as a history professor at Dominican University and “Unofficial Medievalist to CNN,” David Perry ’95 is a disability rights journalist and author of the blog “How Did We Get Into This Mess?” Following his lecture at the University on Oct. 13, Perry sat down with The Argus to discuss his unconventional career. Due to its length, the interview will be printed in two parts. The Argus: You mentioned during your talk that you came away with an earring from your time at Wesleyan. In a less concrete sense, what did you carry away from your four years here? David Perry: That’s a good question. I thought you were going to ask me about my earring, which I actually got in Harvard Square and not here. But it was with my Wesleyan girlfriend. Wesleyan provided me with both companions and mentors in really intense ways. I got to work very closely with a lot of professors, one-on-one, three-on-one. I did theater and history, and in both contexts, I feel I really got to have intense creative and intellectual relationships with experts…people who were teachers but also scholars or artists, who wanted to both do the work and teach the work and partnered with willing undergraduates. And then also my undergraduate cohort….We were all on slightly different paths, and sometimes even radically different paths, but we all had comparable experiences, at least at the best of times, of finding a niche and then wherever we wanted to take that niche, Wesleyan really supporting us as we [went]. Especially 20 years on, back here on this beautiful day on campus, for the first time I’m feeling very nostalgic and extremely positive about my Wesleyan experience. A: You have two children, a son with Down’s syndrome and a daughter, and have written about disability rights in depth as well as women’s rights. How have your children’s identities informed your work? DP: Everything I started with when writing about disability really was driven by my experience as my son’s father. A lot of parents start there; I get worried that a lot of parents get stuck there. I mostly haven’t written essays about my son, maybe one or two a year plus a little blogging, but some parent bloggers and writers get really stuck in that parent space….The disability community needs parents, but it also as much as possible needs to center the voices of people with disabilities themselves and not the parents. And I try to very intentionally seek out self-advocates and as much as possible self-advocates from marginalized communities. So I’m talking about queer people with disabilities, people of color with disabilities, or queer people of color with disabilities, and I’m thinking of several specific writers in this context. My experiences of becoming a father to a boy and a girl, to a child with a disability and a hyper-verbal girl in a patriarchal world, definitely inform my advocacy and my writing. It’s a starting place, and I think I’ve now moved beyond that in many ways, in part because my children get to control their own narratives more and more as they get older. My daughter really doesn’t want me posting pictures of her to Twitter, which I think is a great decision and one that I completely respect. It’s harder to know to what my son would consent, because of his verbal limitations, and so I try to err on the side of not sharing personal details and not telling his story [while] trying to tell my story…it’s kind of a complicated place. A: You voiced some criticisms of the disability rights movement during your lecture. Where do you see room for growth or improvement in that field? And those are real concerns. I am that concern, and we have real issues going on; they are not trivial issues, but they are not the most pressing and the most dangerous kinds of issues. A: What intersections do you see with the Black Lives Matter movement and other marginalized identity groups? DP: They’re happening more and more…they’re happening online. When you have a black disabled person joining Black Lives Matter, tweeting at Black Lives Matter, tweeting at the leaders of these movements…and also when you have people from outside the disability community reaching out to people in the disability community saying, “Hey! Pay attention to racial justice.” And there are certain key figures, there are people like Lydia Brown in Boston, and Talila Lewis in Maryland, and Leroy Moore in California, and a lot more…who are doing this work on a day-to-day basis and trying to make it happen. I just want to make sure that the people with resources are paying attention to the most marginalized issues and that in addressing them, they are centering the voices of people who live in these communities. The Ford Foundation is a good model; they have just become aware of disability rights as a major issue for them when combating inequality, and that’s great. But if what they do is hire a bunch of wealthy, white, well-intentioned consultants to manage where they put their money, they’re not actually going to put their money in the right places. These are lessons we’ve learned in every other social justice movement, in which the resource-privileged people are the people who…come into a problem and say, “I’m going to solve this problem.” And if you don’t listen to and center and respect and empower the people with lived experience, you might do some good, but you might do a lot of unintentional harm and you might not do all the good you can. I want these movements involved, and then I want their boards to diversify, and I want their budget-controlling, managerial staff to diversify…I’m sort of an incrementalist; if that hasn’t happened, I want them to pay people from communities good professional consulting wages to work [with] them. That’s the kind of steps I think need to be taken. A: Can you tell me more about the universal model of policing you’ve envisioned? DP: That’s a complicated question. I’m in the middle of writing a 25,000-word chapter of a book called “The Cult of Compliance: Why Police Kill People with Disabilities,” coming soon to bookstores near you…and by “soon,” I mean 18 months from now. The big overview is, I propose a model called “universal design for policing,” which takes from the best practices in the history of the disability rights movement and applies them to policing. This is something that hasn’t really been articulated, although there are plenty of people who are sympathetic to me, who have similar ideas but wouldn’t frame it that way. So in the history of the disability rights movement, we have two good ways of addressing needs. One of them is accommodation, in which someone says, “I have a need,” and then you create a system to meet that individual person’s need. And those are fine; that’s how the ADA [Americans with Disabilities Act] works, that’s how this university works. That’s good. But it’s better when we create systems that pre-meet needs, whether someone discloses them or not….For example, for every person in a wheelchair, you could assign them a personal assistant to open doors for them and to carry them upstairs. Or you could build ramps and power doors. So obviously, for that example, we have in fact built ramps and power doors…mostly. That’s better; that’s a universal system. Right now, even when disability enters the conversation around policing, it’s usually, “Ok, we have people with mental health crises. When we know there’s a mental health crisis, let’s deploy all of these specific, mental health-related resources.” That’s kind of the national conversation right now around mental health and policing, and it’s good. There’s no problem with that. But the better solution is to have every cop treat every case as if there was some possibility of some kind of neurotypical or physical difference behavior. Every case, every call, to not, as I like to say, “presume compliance.” In the disability rights movement, we’ve got this phrase, “presume competence,” that your baseline, when you encounter someone, is to presume competence…so [when] you meet someone who’s nonverbal, you don’t assume that they can’t communicate; you assume that you don’t know how they communicate. You presume that they are competent. Well, I like to talk about “presuming compliance” as a baseline in every encounter with the police, as opposed to presuming noncompliance and taking it as a threat. That’s going to be great for the deaf person who can’t hear the verbal command; it’s great for the diabetic person who is in insulin shock, and instead of assuming they’re noncompliant and drunk, the police officer goes in with more compassion and thought. It’s also going to be great for the guy who just doesn’t want to listen to the police officer but is in fact not a threat. It’s going to be good for the person who is running away from the police officer, as we’ve had in Chicago where I’m from, and instead of [shooting], the police operate with a baseline that there could be something going on…[and] that doesn’t mean that they’re a threat. Unless [the police] have other evidence of threats, and there are real threats out there. We need bigger systems for mental health care; I mean, there’s a whole rabbit hole we have to go down in terms of creating a sustainable society for people with disabilities of all sorts. A: You’ve touched on mental illness as part of the spectrum of mental disabilities. Where do you believe mental illness falls as compared to other, more noticeable disabilities? DP: Invisible disability of all sorts are very complicated in terms of society….Every time I go to a new college campus or back to an old college campus, I look at their diversity inclusion page. They’re usually great, especially at a place like this, and I look to see whether there are any images reflecting disability. Wesleyan does not have any, and I’d have to say that’s true for 99 percent of the colleges in America. That’s not unusual. Now, I’m also sure that it showed me 20 to 50 students, and some of them had invisible disabilities. If we’re not aware of that as a fundamental aspect of the human condition, then we don’t see it. Mental illness—mental disabilities—is a form of disability; they are protected under the Disability Rights Act, they require supports…. Stigma, lack of supports—that’s a social problem. So when you talk about people who have depression or anxiety who deal with it by not telling anybody, by self-medicating with drugs and alcohol…well, if we’re talking about that at Wesleyan, that’s one set of problems; I’m more interested in those issues on the South Side of Chicago, where there’s lots of untreated PTSD and depression and anxiety which we can talk about as emerging from a racist, oppressive state and trying to live within it. So there’s an intersectionality point. But we also know there are no services available to a lot of those people; there’s stigma within the communities about talking about it, and people self-medicate. And you can say, “Well, that’s their medical problem.” But when we zoom out and really look at it, we see that there’s a huge social component to it, and I want us to work on the social components. A: When you talk about the South Side of Chicago, it’s understandably very different from someone like Donald Trump. Nonetheless, you’re coming in as a white native of the city and saying, “Look, there are disabilities within this community.” How do you recognize your status as one of privilege and still do work that benefits that community? DP: This is always an issue for a journalist. They—we—are almost always coming in from the outside; if we are an employed journalist or a published freelancer or even a college journalist, we have lots of privilege. If we’re writing about social injustice as a journalist, we are almost always coming in from an outside and privileged perspective. That’s something I’ve had to learn as a self-invented journalist, who didn’t plan to become one. And I think you deal with it first of all by telling the truth to the best of your ability, and second of all, and most importantly, finding people within the community who want to talk about these things, and reporting accurately and honestly and empathetically and clearly and as powerfully as possible what they say, and what they say they want, and what they say they need. And yes, it would be great if you could just go to people who are marginalized and say, “Here! Have my column! You write your own essay.” I’ve been saying that in the disability rights community, and some people say, “Yes, I want to write my own essay,” and I’ve been working with them. But for other people, it’s hard to do that kind of reporting; it takes skills, and it takes privilege. We need to diversify our newsrooms; we need to diversify our universities. We need to do a lot of things. But at the baseline, you go to the communities, you listen, and you seek out people with lived experience, and you report accurately on that lived experience. That’s my best solution. I’m interested in better solutions.